This move-in ready 3 bed/2 bath home features an open floorplan with high ceilings and lots of windows that let in loads of natural light. Relax on your covered lanai overlooking the spacious and fully fenced back yard with a firepit that is perfect for toasting marshmellows. Enjoy grilling or dining alfresco on your deck or brick paver area. Entertain with ease in your light and bright kitchen with tons of counter space, breakfast nook, and closet pantry. The kitchen overlooks the large dining room that opens to the spacious family room with a vaulted ceiling. The large master suite has a vaulted ceiling, plenty of room for a king size bed, and features a large walk-in closet. The attached master bath boasts a large vanity with dual sinks, a framed mirror, and a walk-in shower. The second bedroom is 15×12 and has a vaulted ceiling and a walk-in closet. There is access to the second full bathroom from the second bedroom as well as the hallway. All curtains/drapes as well as all appliances stay including the refrigerator, range, microwave, dishwasher, washer, dryer, and water softener. Seller is offering a 1 year home warranty up to $500 to Buyer(s) at closing. NEW ROOF in 2013. NO CDD fees & Low HOA fees- only $350/year and includes a community playground. 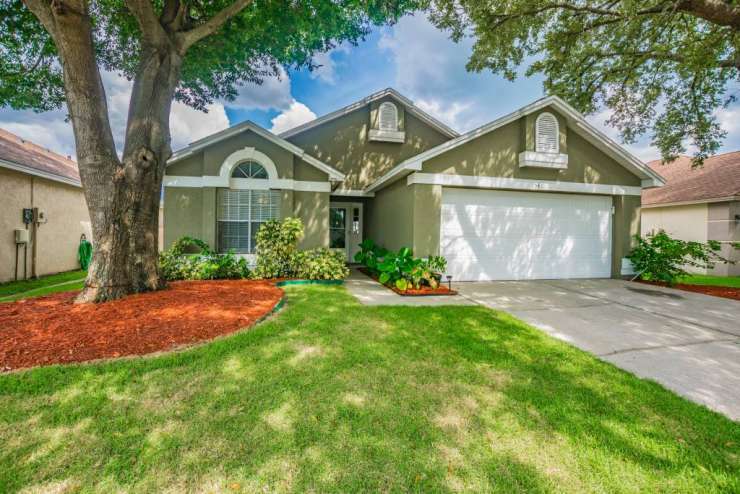 Providence Lakes is conveniently located near I-75 and the Selmon Expressway for an easy commute to Downtown Tampa, MacDill, Westshore, Airport, and more. Centrally located near many restaurants, shops, Brandon mall, and so much more!